In the Western society the understanding of chakras has come into the public domain and there is a feeling in the air that we are in a ‘new age’. We have a new mentality, a new morality and in general we have an insatiable desires for the new. Not only every new things in the public domain there is a thirst for the new. As with all things this is a doubled edge sword. The thirst for the new allows for all manner of new theorise and the problem with this is, how do we know which one of those theories being put forwards is the correct one? The tendency is to add our own interpretation and understanding in accordance with our perceptions. Our desire for the ‘new’, has meant that tradition has gone out of the window we very rarely look back into the ancient books of knowledge to see if the answer can be found there. We are much more likely to accept some new theory as this is good for debate, we can flex our intellects and gather to ourselves a feeling of ownership that we are modern and that we are the real movers and shakers of our times. All manner of health practitioners have stamped their opinion on the chakra system, opinions on how it works, opinions on the understanding of the qualities of the chakras, opinions on the colours and the function of the chakra system, with this it has become more and more difficult to extract the true meaning of he chakras and their function. Hence there are many interpretations of their qualities and many more theories are being put forwards all the time. Mostly it’s not good for the knowledge base it simply good business. On one hand it is a good thing that the knowledge of the chakras has filtered down into the public awareness.We have had chance to ponder their subtle qualities, we have a concept that we have a subtle body. Generally speaking the information we have on the chakra system is confusing, conflicting, and unintelligible to the western material mind. The possibility that we have considered that we are the owners of a subtle energy systems is important, but we must understand that the chakras system has its basis in an ancient tradition dating back before the birth of the Lord Jesus Christ, which many New Age teachers have barely explored. The chakras are first mentioned in the Vedas, which are the oldest written tradition in India , (2,000 – 600 B.C.) prior to this there was an oral tradition of debate into the more spiritual aspects of our being. The Vedas were largely written by the Indo-European invaders of India , known as the Aryans. The Aryans were said to have entered India on chariots, and the original meaning of the word chakra as “wheel” some believe to be a reference to the chariot wheels of the invading Aryans. I do not hold this view as it is one born from a material perspective of the world. My view is that the highly evolved saints at that time experienced the chakra system as wheels of energy rotating within their physical body they were aware of their subtle system whilst meditating. The saints then passed that knowledge down to their disciples who translated the experience into words. (The correct spelling is cakra, though pronounced with a ch as in church.) The word was also a metaphor for the sun, and denotes the eternal cycle of time called the kalacakra, or wheel of time. In this way, it represents celestial order and balance. 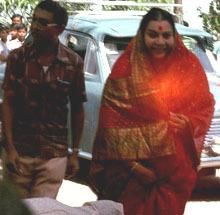 It is said the Cakravartins were preceded by a glowing golden disk of light, much like the halo of Christ, only this spinning disk was seen in front of them, which is also how Shri Mataji describes them, as disks of light. The birth of a Cakravartin was said to herald a new age. It is also said that the God Vishnu descended to Earth, having in his four arms a chakra, a lotus flower, a club, and a conch shell. So too Lord Krishna has a spinning disk on the 1st finger of his right hand. 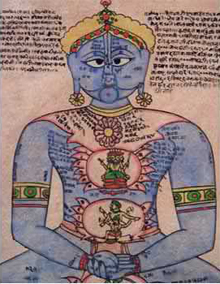 There is some mention of the chakras as psychic centers of consciousness in the Yoga Upanishads (circa 600A.D.) and later in the Yoga Sutras of Patanjali (circa 200 B.C.). Patanjali’s tradition was largely dualistic, however, stating that nature and spirit were separate, and that the goal of yoga was to rise above nature. The chakras and Kundalini came to be an integral part of yoga philosophy in the tradition of non-duality, which arose in the 7th century.